Tragedy: The gruesome scene at the accident site. A RANGE Rover driven at high speed by a Chinese national caused the instant death of a Zambian truck driver after the luxury vehicle crashed into truck that got stuck in mud next to the B2 road between Karibib and Wilhelmstal. According to the Erongo Regional Crime Investigations Coordinator, Deputy Commissioner Erastus Iikuyu, the bizarre motor vehicle accident occurred at about 21:50 on Tuesday evening roughly 20 kilometers outside of Karibib. “Two imported trucks destined for Zimbabwe and driven by Zambian nationals were on their way to Katima Mulilo. The driver of the first truck turned off towards Omaruru just outside Karibib but the second driver missed the turn-off and continued on towards Okahandja. When the second driver realized his mistake about 15 kilometers further, he attempted to turn around but his vehicle got stuck in the mud next to the road caused by good rains over the past two days,” he said. Iikuyu said the truck got stuck in such a way that the front part of the vehicle caused an obstruction in the road. The 67-year-old driver of the second truck then contacted the 42-year-old driver of the first truck for help. 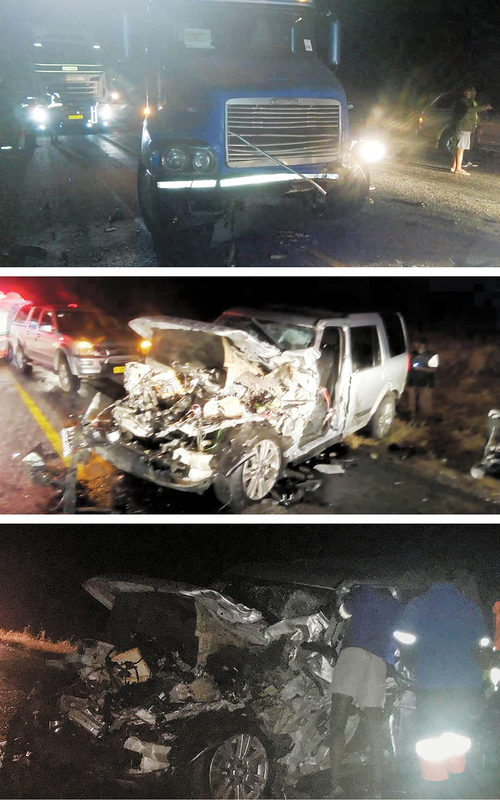 The driver of the second truck arrived on the scene and while he was busy attaching a towing cable to the second truck, the Range Rover driven by the Chinese national crashed into the stationary vehicle at high speed. According to Iikuyu, the 42-year-old driver of the first truck was directly in front of the oncoming Range Rover and he unfortunately got smashed during impact. “The Chinese national driving the Range Rover only sustained light injuries while his passenger, also a Chinese national, sustained a broken leg. Both were taken to the Okahandja hospital for stabilization and further medical care,” he said. He said Okahandja Paramedic Services Ambulance was used to transport the injured Chinese as the Usakos State Hospital was not reachable due to flowing rivers caused by heavy rain prior to the accident. He said the 67-year-old driver of the second truck sustained less serious injuries and a passenger, also a Zambian national, was unharmed. The body of the deceased person was taken to the Omaruru State Hospital Mortuary and his next of kin is yet to be informed. 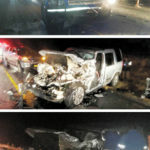 Iikuyu said a case of culpable homicide and reckless and negligent driving has been opened and investigated.